Attorney General Ashley Moody, along with the Federal Trade Commission, took action in federal court against a Sarasota-based veterans charity. 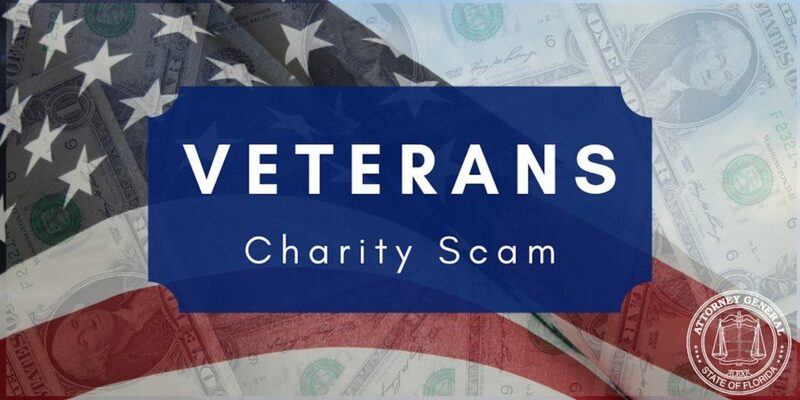 American Veterans Foundation, Inc. and its founder, Paul K. Monville signed an order agreeing to a permanent ban against soliciting charitable donations or participating in oversight and management of charities in the future. According to the complaint, filed at the same time as the settlement agreement, AVF raised approximately $6.5 million between 2014 and 2017 from donors nationwide based on misleading promises that donations would assist veterans. According to the complaint, AVF and Monville used misleading mail brochures and high-pressure telephone tactics to create the impression that the charity was dedicated to preventing veteran homelessness. In reality, less than three percent of the funds went to helping homeless veterans. AVF and Monville made multiple false promises to donors, stating they would send care packages to service members overseas, help veterans with counseling, and donate for charitable purposes. Most contributions went toward fundraising, employee compensation and other overhead, with little money being spent as described to donors. The defendants are accused of violating the FTC Act, the Telemarketing Sales Rule, the Florida Deceptive and Unfair Trade Practices Act, and Florida’s Solicitation of Contributions Act. The order imposes a monetary judgment of approximately $6.5 million. All remaining charitable assets will be paid to a legitimate veterans charity, subject to court approval. This lawsuit is the third action taken by the Attorney General’s Office within the last eight months against charitable organizations that did not provide the services promised to service members and veterans. Attorney General Moody seeks to redirect any money recovered in these lawsuits to legitimate charities to ensure the donations are used as donors intended. The two previous cases include a complaint filed against Help the Vets, Inc. and Neil G. Paulson and a settlement agreement with Vetmade Industries, Inc.
Look for informed reports and judgments on organizations at Give.org, the Better Business Bureau Wise Giving Alliance. In addition to consulting third-party sources regarding a charity’s history and reputation, donors should ask whether a charity is working with a for-profit fundraiser, and how much that fundraiser is receiving in compensation.